Pomegranates. Who doesn’t feel a little rush of excitement each time they peel open the rough exterior to reveal those blood-red, shiny little orbs of juice, sandwiched between tough white membranes and soggy pulp? I know I do. 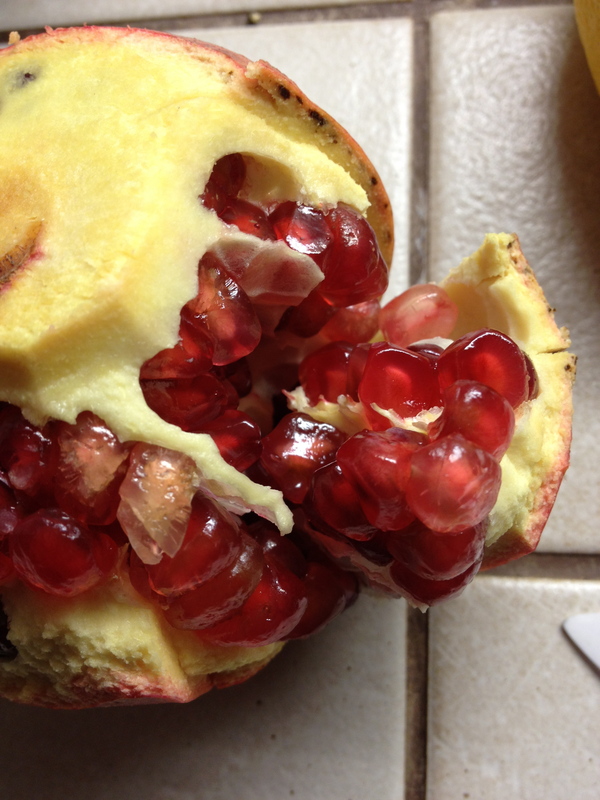 It had been awhile since I’d experimented with this exotic fruit, and it wasn’t until finding some at my local supermarket recently that I decided to delve into the goldmine of pomegranate-based recipes online. I knew that I wanted to try chocolate chunk cookies with pomegranate arils. That, was a given. But what else would I do with them? How could I incorporate the sweet bursts of refreshing red juice into a savory dish? The answer, it seems, was right in front of me. 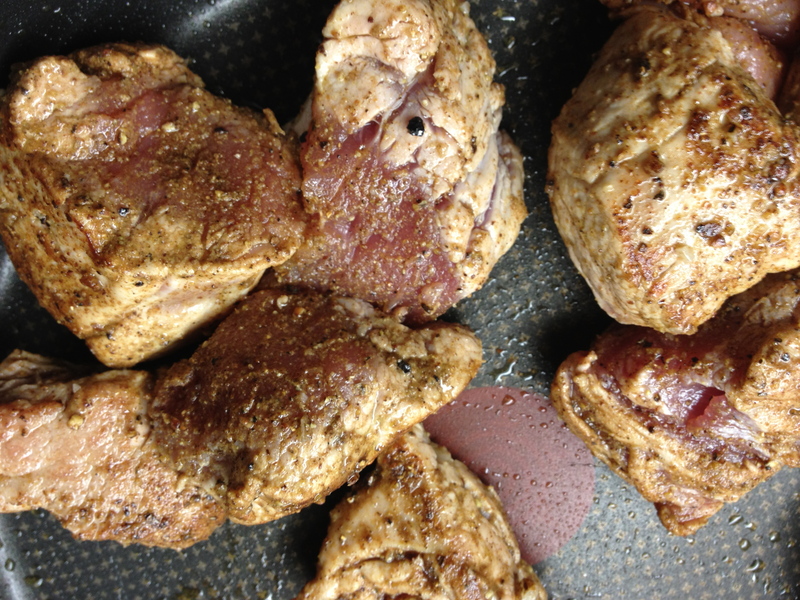 By incorporating them into my all-time favorite versatile dish, filet mignon de porc, or pork loin. After a quick search, I didn’t find any one recipe that suited me to the tee, nor one for which I had all of the ingredients. So, I threw in a bit of what I had, forgetting whatever I didn’t have, and made it up as I went along. Unfortunately my pomegranates were a bit odd; under and over-ripe at the same time, leaving me with mostly light pink arils and several white ones, and a few brown ones. The flavor was still there but seemed like a fraction of what it should have been. Which simply means that while this dish was very good, I’ll be excited to try it again with proper ingredients. 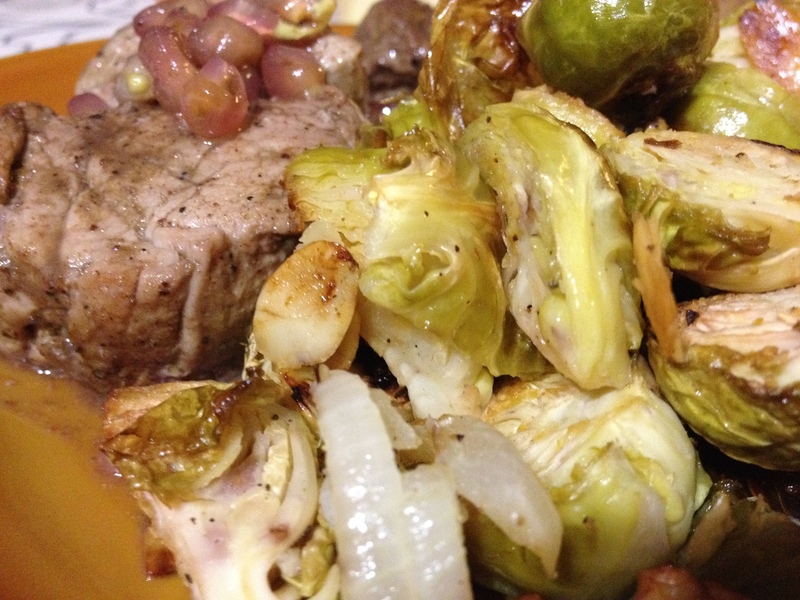 I also had some brussel sprouts lying around. A first for me. I guess I just never trusted them, and let myself get all wrapped up in the American cliché of brussel sprouts being the foulest thing you’ll ever taste. I decided to buy them anyway, figuring that the bitter flavor might be a nice counterbalance to the sweetness of the pork dish. And it was, the two worked beautifully together. The bitter and tart lemon and garlic marinated sprouts with their toasted walnuts and almonds were perfect to take the edge off of the sweetly glazed pork. Or was it the other way around? Well, all that I do know is that next time I make sprouts, I may just throw in some pomegranate because it really added to the flavor. 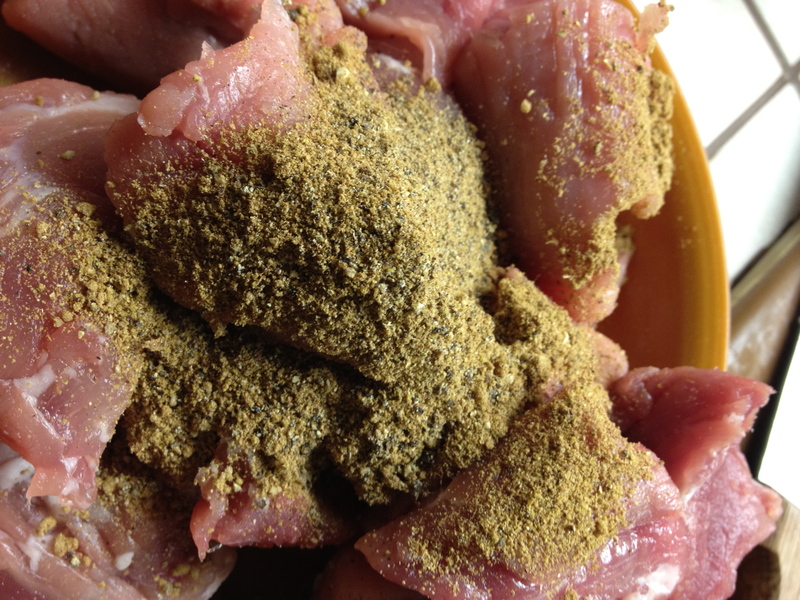 Once your pork is trimmed and cut, mix the spices, salt and pepper in a large bowl. 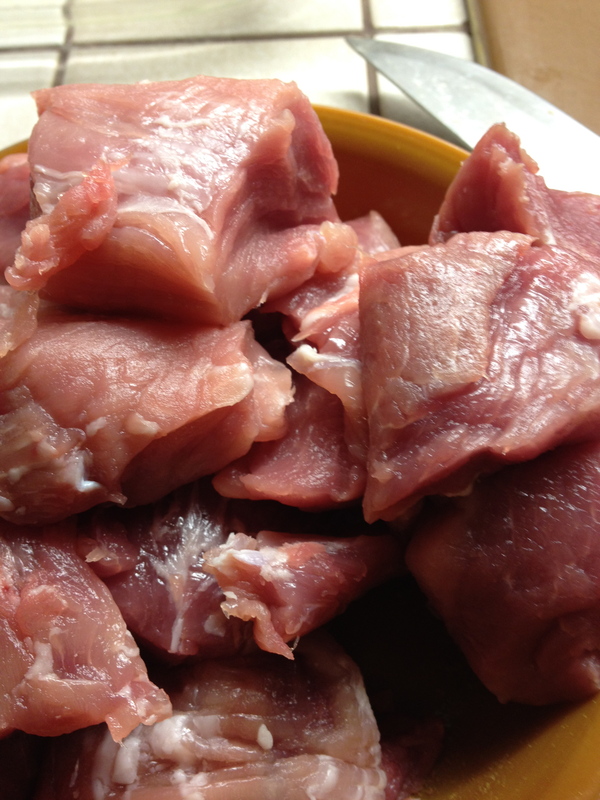 Dry the pork chunks off slightly with a paper towel and then drudge them in the spice mixture, making sure to use all of it and to coat the pork as evenly as possible. Heat the olive oil in a pan over high heat. 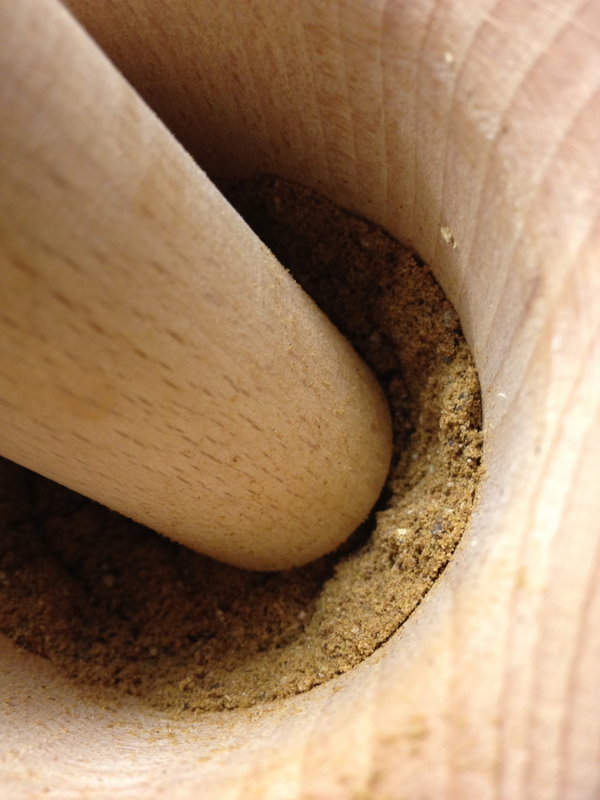 Once the oil is hot, drop in the pork and brown for 4-5 minutes, turning often and leaving no surface behind. Add the vinegar first, and continue to cook on high heat for another 3-4 minutes before adding the red wine. Season with additional salt and pepper, then turn the heat down to medium. Add the 1/2 of your pomegranate seeds, stirring vigorously so that you’ll break up the seeds and release their juices into the sauce. Let simmer for about 15-20 minutes, until the sauce has reduced by half, and then add the remaining pomegranate seeds. 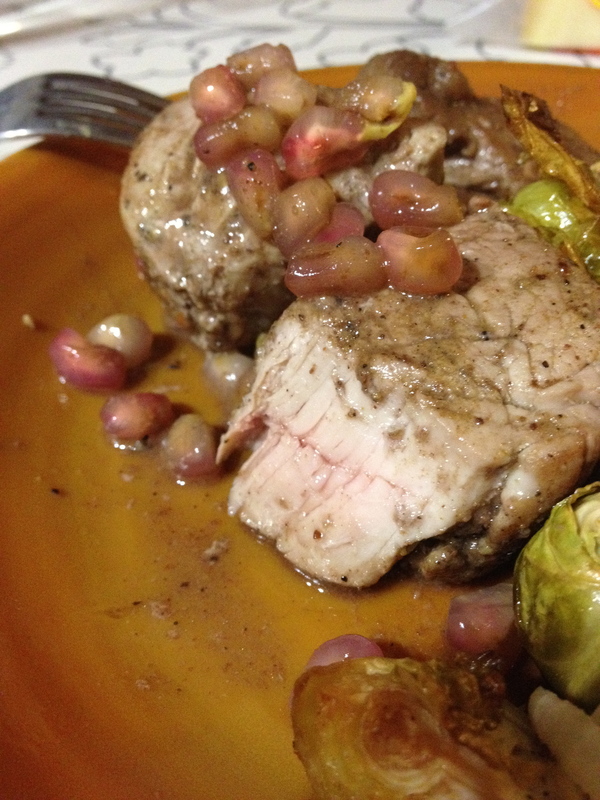 This entry was posted in General, Recipes and tagged Cinnamon, Coriandre, Cumin, filet mignon, Pomegranate, Pork tenderloin, Red wine by alamericaine. Bookmark the permalink. Wow. That looks amazing. I just stopped by to find your green bean casserole recipe and found this! Yum. I just smacked the seeds out of a couple pomegranates today. It was fun! !